This new line of high-quality adhesives will stand the test of time, even in the most demanding of environments," said Stuart Francis, managing director. Chemique Adhesives recently launched Aerotak, a new range of adhesives designed specifically for the aircraft interiors industry, according to the company. The range consists of a variety of sprayable, solvent-based and water-based adhesives used in the manufacture of aircraft seat covers. The Aerotak range provides customers with a simple, versatile adhesive for bonding combinations of fabric, leather, foam, e-leather and scrim materials into style pads utilizing a hot press stamping method. Aerotak features include flammable and non-flammable formulas, and fire-retardant properties including CAS201FR, specified worldwide by many leading airlines for bonding seat covers. Chemique, a global company at the vanguard of interior adhesive technologies for many industries, focuses on developing products that are high quality and reliable. With Aerotak, Chemique provides a line of adhesives that protects from fire as well as provides strong bonds, key factors for customers in the aircraft interiors industry. 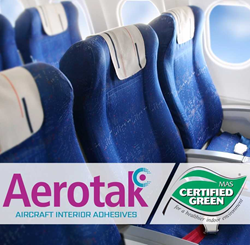 Aerotak recently received the MAS Certified Green certificate of compliance, designating it as a low VOC (volatile organic compound) emitting adhesive, meaning it is environmentally safe. Chemique Adhesives, Inc., is a pioneer in the development of solvent-free polyurethane, water- based adhesives and adhesive application equipment. It has fast become the first-choice adhesive supplier for a diverse range of industries, including transportation, foam conversion, raised access flooring, architectural panels, portable buildings, furniture, and many others. Chemique’s experienced chemists and engineers provide innovative solutions for customers’ adhesive and adhesive application needs. With operations across North America and Europe, Chemique specializes in the development of custom bonding solutions for customers worldwide. For more information, visit http://www.chemiqueadhesives.com.